UPSTREAM BATTLE Sonoma Land Trust's Tony Nelson, right, directs work on a Stuart Creek steelhead habitat project. The workers had finished about half the restoration work in a section of dry Stuart Creek when all of a sudden—there's water in them-thar creeks! That was the recent cry in Glen Ellen, and all around Napa and Sonoma counties: drought-stricken creek beds throughout the area sprang to life with a fresh flow of water, thanks to the South Napa Earthquake. "It's kind of a trip," says Bob Neale, stewardship director at the Sonoma Land Trust, the organization at the helm of a project to restore habitat for threatened steelhead in Stuart Creek. The organization is deconstructing a dam and adding chute-pools for migrating steelhead, among other restoration efforts along a roughly two-mile stretch of the creek, but the sudden flow of water briefly threatened an Oct. 31 completion deadline set by state Fish and Wildlife officials. That's when the water is supposed to start flowing, and nobody's allowed to be working in the creeks. The surprise outburst made for a stressful moment at the Stuart Creek site. 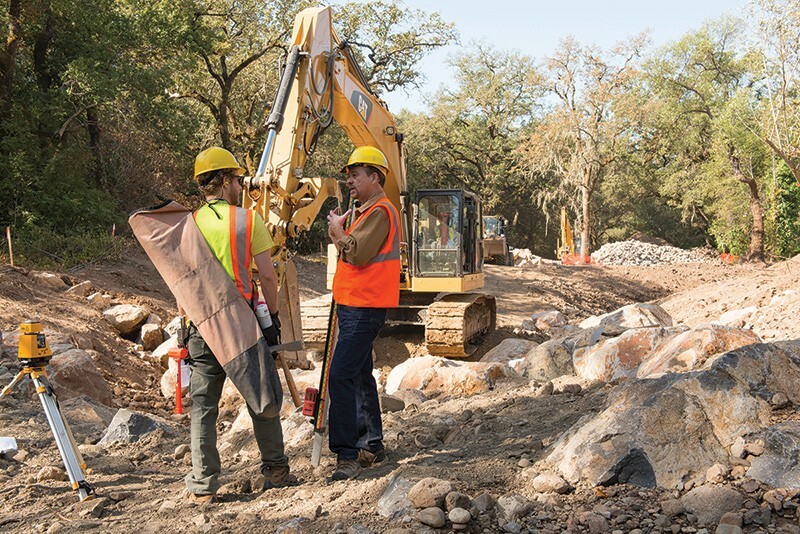 "We got about halfway through the creek channel work [and] then the water started coming," says Tony Nelson, Sonoma Land Trust project manager. "I was concerned that the flows would increase to the point it would affect our ability to finish this in time for the deadline," he says. Here's what happened: The state requires that projects like Stuart Creek divert any water that's flowing in the proposed work zone. The water is pumped around the work area and then re-enters the flow. "We had the plans, but with the drought and everything else, when we got to one of our sites, there was no surface water at all. We didn't have to move the water—there wasn't any." Hence, there was no pumping at this part of the job site when the water started flowing downstream. Nelson says the diversion system was installed by the contractor, Hanford ARC, and work continued in that part of the project area. "Right now, we are on track," he says. As for the sudden flow of water, its source and timing, experts say it isn't unusual after an earthquake, but it did bring with it a couple of surprises. Water is released as a result of the earthquake's shaking and subsequent dislodging of the earth and rock that has it locked underground. Generally speaking, the bigger the earthquake, the more water seeps from the earth—and it's almost definitely groundwater in this case, say experts. "Some of the spring flow is pretty large in volume," says Tom Holzer, a Menlo Park–based seismologist with the United States Geological Survey. "This is an earthquake on the smaller side, so I'm a little surprised at that, but I'm not stunned." The renewed creek flows—whose likeliest source is shallow groundwater reserve broken loose by the quake—are fleeting, says Holzer, and the unshackled water will likely recede before too long. "We would expect this to decay fairly quickly in a few weeks to a trickle," he says. Once abundant in the stream, steelhead are now faced with the dam, a dilapidated bridge that blocks their passage and other impediments to a proper spawning run. Not to mention the drought. Neale says the steelhead population likely got an immediate benefit from the new flow. "It was probably a good deal for the fish," he says. "The creeks dry up and the fish have to find pools to overwinter. These flows are probably now helping deepen the pools that have fish in them," he adds. "It's always good to have a little more water in the creeks." A little is one thing. "We didn't anticipate that it would turn into Niagara Falls kinds of flows," says Nelson with a laugh. "It definitely made it more tricky and probably a little more expensive. The Santa Rosa–based nonprofit purchased properties adjacent to the creek, including the Glen Oaks ranch in 2011, says Neale, and this spring it got a $700,000 grant from the California Department of Fish and Wildlife's Fisheries Restoration Grant Program. The creek is a critical "pinchpoint" between the Mayacamas and Sonoma mountains—a sensitive wildlife passageway for the steelhead, a federally designated threatened species in California.